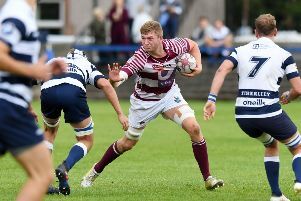 Capital bragging rights are up for grabs when Watsonians and Heriot’s go head-to-head on Tennent’s Premiership duty under the Myreside lights on Friday night (7.45pm). After a mixed start to the campaign, Sonians have hit their stride and are looking to extend a three-match winning run that includes two away victories. Those results leave them in fifth spot and within striking distance of a play-off berth. However, coach Steve Lawrie felt his men spent too much time on defensive chores in the win at Stirling County two weeks ago, and is looking for more in attack. “We have worked hard in training to develop a couple of areas that we believe are key to improving our overall output,” said Lawrie. The visitors are unbeaten in four fixtures and lie third in the table. Coach Phil Smith welcomes back several men who have been out through injury, and is relishing the chance to make it a double, having squeezed home in the reverse fixture earlier at Goldenacre in September. A win for the hosts would see them move into the top four, at least until tomorrow when a home victory for Currie Chieftains over leaders Ayr (2.30pm) would put the Malleny Park back in the play-off berths with seven matches to play. Chieftains were outplayed by Boroughmuir two weeks ago but co-captain Fergus Scott and Dutch internationalist Vince Wight back from long-term injury. Head coach Ben Cairns is looking for a vital win and also wants to pay tribute to scrum coach and Currie stalwart Campbell Reynolds whose sudden death shocked everyone at the club. Edinburgh Accies welcome Stirling County (1.30pm), with 17-year-old full-back Harry Paterson handed a debut as the hosts seek a first win of the campaign. Muir, who still harbour hopes of fighting their way into the play-offs, travel to face Hawick and will be looking to reproduce the scintillating rugby that allowed them to topple Chieftains last time out. Coach Peter Wright makes one enforced change, with Matt Walker replacing the injured Rory Drummond at flanker.